RUSH: This is George in Raleigh, North Carolina. George, hi. I’m glad you waited. Welcome, sir. CALLER: Thank you, Rush. It’s a pleasure to talk to you again. Rush, everything on this planet that has any value whatsoever — whether it be a Picasso or bar of gold — is guarded with firearms. I don’t understand why people don’t think that their children are just as valuable as a bar of gold, a dollar bill, or a Picasso. I’m not talking about the media or the liberal legislators. I understand what game they’re playing. I’m talking about people who have children in school who are against arming people to protect their children. I can’t wrap my head around the mind-set! When they take their children to a museum, there’s an armed guard there, and the children understand that the armed guard is there to protect them. Why wouldn’t they understand that the armed guard at their school is there to protect them? RUSH: Have you come up with an answer as you have…? It sounds like you asked this question of yourself rather often. Have you got an answer to it? 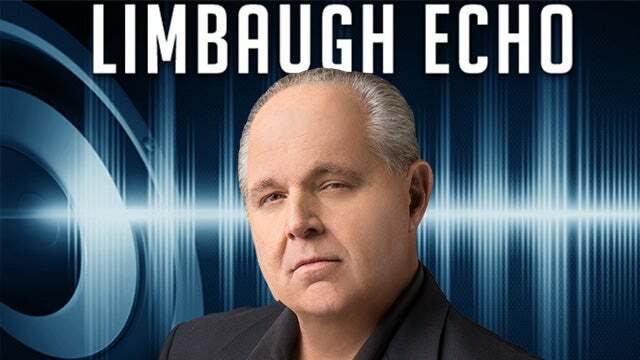 RUSH: Well, my point, there is an answer to this, and of course I, El Rushbo, have it. But before that, I want to get to some sound bites. I want you to hang on the phone here, because you’ve raised the question. 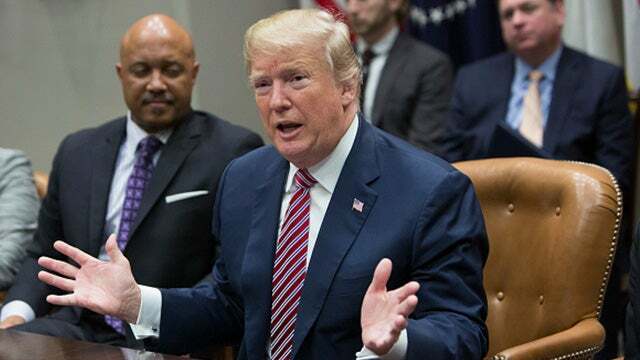 And Trump raised the point yesterday, he offered it as a suggestion and then asked people in the room, “Show of hands. How many are in favor of this?” And some hands went up. “And how many of you think it’s not a good idea?” And more hands went up in that room yesterday in the White House, state dining room. And there’s a reason for it. But we’ve got some audio sound bite commentary on this. Jeffrey Toobin, who, by the way — didn’t get to this yesterday — Jeffrey Toobin accused, Jared Kushner of being a member of the Lucky Sperm Club. I was amused because people act like they haven’t heard of that before, lucky sperm. Lucky Sperm Club applies to about half the people that live where I live, if not more. It’s just a fact of life, you get used to it. Lucky Sperm Club. It means you’re born to wealth and so forth. It was an insult to Jared Kushner, that he wouldn’t be anywhere if it hadn’t been for his dad and having married Ivanka, nobody’d know who this guy is, publish a little magazine, that be it. It was intended as an insult. Toobin is a member of the Lucky Sperm Club in a sense. His mom was a great NBC infobabe, Marlene Sanders. But, anyway, here’s Toobin on CNN last night talking about concealed carry in schools. TOOBIN: When you hear the president of the United States say the answer is to give every teacher in America a gun, that is insane. That is an insane idea. Seriously? Did anybody go to school here? Does anybody remember their teachers? Do you think we should give all of them guns? Do you think they want guns? What kind of country do we live in? RUSH: Oh, come on, stop with the sanctimony. Trump never said all teachers. He said people that wanted to volunteer to do it, to be trained and to be kept current in their training. He didn’t say every teacher. And he made a point to say that whoever would be armed in the schools would be professionals and they would not be known. They’re not gonna be walking around carrying guns on their holsters. This is classic. Trump did not say every teacher. But it’s greeted with, “That’s insane, it’s insane, it’s insane, it’s insane, it’s crazy insane, it’s ridiculously insane.” What’s insane is the never-ending reaction to these shootings that we get from people like Toobin that never change and never result in any positive change, just the same bleating, the same whining, the same false allegations, the same misappropriation of blame. Never any solutions. Just impugning and laughing at, making fun of people who try to come up with ideas. Ideas, by the way, which are applied in virtually every other walk of life when you’re talking about public gatherings. There are armed security personnel everywhere you go. The objective is you don’t see them. In some cases you do, obviously, uniformed. Up next is Chris Murphy. He is a Democrat senator from Connecticut. And he’s asked to react to the president’s suggestion of concealed carry in schools. MURPHY: That’s an insane idea that will make our schools less safe, not more safe. It’s a creation of the gun lobby. Communities and homes that have more guns are more likely to be subject to gun crimes. It’s a recipe for disaster. RUSH: No, it’s the exact opposite. MURPHY: What happens when you arm teachers is, one, you put a whole mess load of guns close to kids that can be used accidentally. Second, you create crossfire that can get a lot of innocent people killed. Third, you make it hard for people who are responding to figure out who the good guy is and who the bad guy is. RUSH: This is so stupid I shouldn’t even have to react to this. Every bit of that is so dumb I shouldn’t have to react to it. What’s your reaction to it, George, in Raleigh? RUSH: How about this. In exchange for going to the training and in exchange for becoming a licensed firearms, quote, unquote, expert, after undergoing a thorough personal background check, every teacher who signs up is paid an additional $20,000 a year. Do you think some teachers would be interested in that? But where is it written — did you hear what this guy said, “Well, the more guns in homes, the more guns in communities, the more dangerous the community.” It’s the exact opposite. It’s the exact opposite. But it is misinformation like this, years and years of it, and propaganda which is causing the reaction you’re hearing. The idea of guns in schools is automatically rejected because of the belief that guns and kids simply don’t go together. Can’t discuss it, can’t have it, that’s obscene, that’s crazy, that’s insane, can’t do it. It’s an emotional reaction, nobody’s even thinking about it. But remember also, these people don’t want a solution that does not involve gun laws being ramped up and the NRA really being punished. RUSH: I checked out a little bit more of the White House meeting going on right now, state and local officials about gun safety. I tell you what, Trump is on a roll here on concealed carry. I mean, he sounds like he’s really advocating it now, which I can tell you is causing conniption fits in the newsrooms and studios of Drive-By Media carrying this. Their heads are exploding right now. This is picking up momentum. It’s picking up steam in terms of Trump explaining it to people, how it would work, why it’s a good idea. (paraphrasing) “Can you imagine a teacher that used to be a Marine,” he said, “an expert already in handling firearms. Would you have a problem, would you know that your child is safe if that teacher was able to deal with –” by the way, concealed carry already is in the schools. Are you aware of that? The bad guys. The bad guys show up, you can’t tell they’ve got a gun until they bring it out and start opening fire. Concealed carry, Mr. Toobin, is already there. Concealed carry, Senator Murphy, is already there. Do you remember when Bill Clinton, back in the nineties, as part of midnight basketball and trying to get bad guys off the street at night proposed 100,000 new cops, how everybody thought it was one of the greatest ideas to come down the pike? We’re gonna put more armed police out there. We’re gonna make our neighborhoods safer. Yes indeed, everybody supported it. What happened to that line of thinking now, ladies and gentlemen? So why is it, what is the answer, what is the answer to the knee-jerk reaction when you mentioned concealed carry in schools in schools, security guards, teachers, whoever, the idea is that nobody would know who they are. The idea is that it’s a deterrent. The hope is that whoever is carrying never has to use it. The idea is deterrence. If a perp knows that he’s gonna get shot — I have heard the reaction, “They know they’re gonna get shot. It’s suicide by cop in there. These bad guys, they want to die.” Well, this guy Cruz doesn’t want to die. I think it’s an example of the indoctrination that has gone on for decades in relationship to children and guns being a horrible, horrible thing.